Who should not take Aleve? What conditions does Aleve treat? Tell your doctor right away if you have any serious side effects, including: easy bruising/bleeding, difficult/painful swallowing, hearing changes (such as ringing in the ears), mental/mood changes, signs of kidney problems (such as change in the amount of urine), unexplained stiff neck, vision changes, symptoms of heart failure (such as swelling ankles/feet, unusual tiredness, unusual/sudden weight gain). This drug may rarely cause serious (possibly fatal) liver disease. Get medical help right away if you have any symptoms of liver damage, including: nausea/vomiting that doesn't stop, loss of appetite, stomach/abdominal pain, yellowing eyes/skin, dark urine. List Aleve side effects by likelihood and severity. Before using this medication, tell your doctor or pharmacist your medical history, especially of: asthma, aspirin-sensitive asthma (a history of worsening breathing with runny/stuffy nose after taking aspirin or other NSAIDs), blood disorders (such as anemia), bleeding/clotting problems, growths in the nose (nasal polyps), heart disease (such as previous heart attack), high blood pressure, liver disease, stroke, swelling (edema, fluid retention), stomach/intestinal/esophagus problems (such as bleeding, heartburn, ulcers). What should I know regarding pregnancy, nursing and administering Aleve to children or the elderly? Does Aleve interact with other medications? 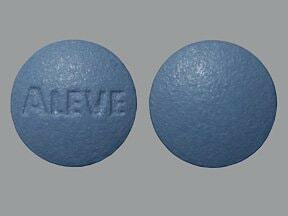 This medicine is a blue, oval, tablet imprinted with "ALEVE". 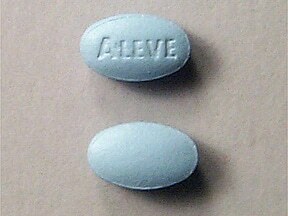 This medicine is a blue, round, tablet imprinted with "ALEVE". 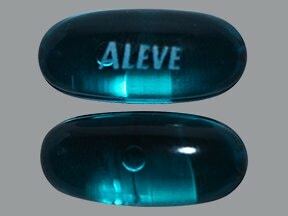 This medicine is a blue, oblong, capsule imprinted with "ALEVE". 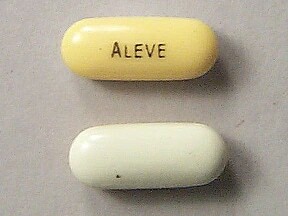 This medicine is a yellow white, oblong, gelatin coated, tablet imprinted with "ALEVE". Have you ever purchased Aleve?